Emeterio remembers the Revolution’s call for tierra y libertad as he struggles on his corn field in Morelos. Recent legislation to privatize traditional community lands is destroying the communal farming system that Zapata promoted and fought for, and all over Mexico campesinos are being forced to sell their lands. But Emeterio will not surrender his ideals, stubbornly riding out to tend his fields even as his own sons emigrate to the U.S. And Emeterio is not alone in his struggle, for a new generation of Zapatistas in Chiapas is also fighting to regain communal lands and in so doing is bringing renewed hope to Emeterio and millions of other beleaguered Mexican farmers. This dramatic and poetic film is a tribute to Mexico’s campesinos. It portrays their ongoing struggle for the land while also relating the now-legendary story of the folk hero Zapata. 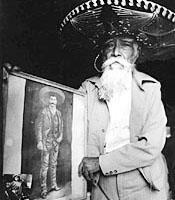 Near-mystical beliefs about Zapata are recounted in interviews with farmers, still-living Zapata family members, and members of the Mexican government who actively try to co-opt his myth and legend. Highlighted by rare archival footage of Zapata and the Mexican Revolution, “The Last Zapatista” demonstrates that the heritage and ideals of zapatismo will drive Mexico’s agrarian struggle long into the future. “The Last Zapatista” is essential viewing for any course in Mexican history or culture, Latin American studies, cultural anthropology, or development issues. It was produced by Susan Lloyd.